If you know of or come across a movie filming post it here. I'll start things off with the Men In Black III movie shoot tomorrow 6/21 on Walker Street between Broadway and Lafayette (one block south of Canal). Expecting to see Will Smith and Tommy Lee Jones. They've been shooting MIB III down on those blocks for the past two weeks. MIB III turned Mercer Street at Howard into 1970's NY a couple of weeks ago. They tried to make it look gritty like the old days, but it's hard to replicate 100 years of dirt and grime after an area has been gentrified and spiffed up. They can just green-screen them out. Or whatever computerized eraser they use whenever I see new films/programs of old NY. but a new condo project has put the location out of action indefinitely. In Hollywood’s version of New York City, the giant metropolis is teeming with secretive, cinematic alleyways — the ultimate urban character actor, always on-call to lend a film a sense of lived-in grit. Take “The Nanny Diaries”: the 2007 film uses an alley as the sort of backdrop that leaves no doubt the story is set in New York. In “The Sorcerer”s Apprentice,” a deserted alley brings the hero to a hidden magic shop, and the titular character in “The Talented Mr. Ripley” lives in a ramshackle apartment down a similarly photogenic byway. Yet the actual city is short on shortcuts. In fact, each of the above scenes was filmed at a single location — Franklin Place in Tribeca — that is now being remade by a real-estate developer. The scarcity of Manhattan alleys that fit Hollywood’s dank, dilapidated typecasting has made those that exist into the city’s unlikeliest icons, virtually unknown to locals but filmed almost as often as the trademark skyline. Most are hidden south of Canal Street, far from the rigid organization of the uptown street grid. Like all desirable New York real estate, scarcity makes these rat-infested and grime-covered passages surprisingly expensive as filming locations. Private owners control a few of these back streets, including Broadway Alley in the East 20s and Great Jones Alley in the East Village. Hollywood’s favorite image of the dangerous New York alley is not completely fictitious: Moezinia can recall dead bodies found dumped in Franklin Place over the years. What leaves him disappointed, however, are the small cameos his alley plays in the finished film. 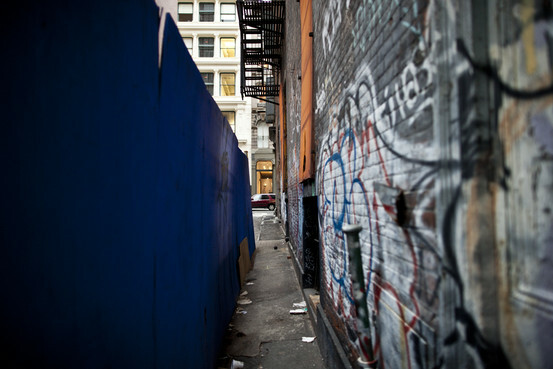 In the case of privately owned alleys like Franklin Place, the property is often divided up among several owners with whom a production company will make individual deals. The total cost for securing one of these alleys can range from $5,000 to $10,000 per day, and beyond. Producers who forgo paying for access can find their productions shut down by the police. On public alleys, including Theater and Cortlandt, there is no official cost beyond a $300 fee required to apply for any shooting permit in the city, according to a spokeswoman for the Mayor’s Office of Film, Theatre & Broadcasting. But the owners of properties abutting the public alleys claim a right to six feet of land measured out from their buildings, and they will typically seek payment in exchange for keeping parking spaces clear during filming. For alleys barely measuring 15 feet across, it’s a request that cannot be ignored. There’s bad news for directors addicted to Manhattan’s alleyways: the spaces are under pressure from the same forces that drained the grittiness from much of the city in the last two decades. The Franklin Place alley is out of commission indefinitely amid construction on a luxury condominium tower. The dilapidated buildings that made Theater Alley a dependable star were torn down recently to make way for more condos, effectively destroying its archetypal look. With ever higher prices for the dwindling supply of alleys, filmmakers will ultimately need to make a choice: pay up to portray New York as the seedy wonderland of the pop-culture imagination or drop the alley cliché in favor of more authentic locations. The first two MIB films were lots of fun; however, the second one clocked in at something like 85 minutes which is an obvious money grab. I suspect MIB 3 may be even shorter, still. Let's see how it turns out. 10 episode miniseries on Cinemax. Storyline centers on the Knickerbocker Hospital c1910. They were shooting on Front St at the Seaport from 4AM till 2PM today. The plastic pipe along the curb hooks up to a fog machine. The posters are reproductions of real company period advertizing. The dog is smoking Surbrug Golden Scepter pipe tobacco. Bicycle ads were popular - Victor and Crescent bicycles. Red Cross Stoves. Singer Sewing Machines. I just couldn't live in those times. Not even a well-turned ankle.